Businessman and former president of the Western Bulldogs AFL club, David Smorgon, is one of Australia’s most ­in-demand and compelling conference speakers. But he insists that it wasn’t always so. Smorgon recalls that his dread of public speaking almost made him decline the presidency of his beloved Bulldogs when he was approached to take on the then struggling Footscray Football Club in 1996. “The first thing I thought was, ‘How am I going to handle the media? How am I going to handle the speaking?’ I thought about not doing it because, frankly, speaking was not something I enjoyed,” he says. Although a trained lawyer, David joined the family business at the age of 23. David advanced to be a senior executive at Smorgon Consolidated Industries – the large family business that spanned meat, paper, glass, plastics and steel industries. When Smorgon Consolidated Industries was sold off in 1995 in a staged divestment it ended a 70-year family history and marked one of the lowest points of David’s life. He and others fought to save the family business and were bitterly disappointed when their efforts failed. When the Western Bulldogs offered David the presidency in 1996, it presented a new opportunity and challenge and David quickly cemented his reputation as a force in the business and sporting worlds. 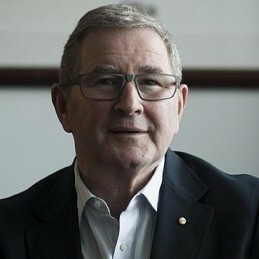 As one of the smaller teams in the AFL competition, David steered the Bulldogs through constant battles of survival in the cut-throat world of AFL, where business perspective and professionalism are paramount. David stepped down as President in December 2012, ending a 16 year reign. In 1996 David and his three sons established Generation Investments focusing on business opportunities, equity and property investments. Smorgon’s reputation as an impassioned, insightful and humorous public speaker spread and his experience as an SCI executive and AFL club president made him a popular keynote and motivational speaker at business conferences. Only duties at the Bulldogs prevented him from entering the lucrative speakers’ circuit full time. So the kid who used to hide at the back of assembly to avoid having to speak in public, started PointMade, which represents him as a professional speaker and provides presentation training for executives and communications consulting to chief executives and company boards. PointMade has just concluded an alliance with management consultant Hay Group which allows Smorgon to work with Hay clients to advise on communication strategies and presentation skills. Smorgon remains executive chairman of Generation Investments, the investment vehicle he started with his three sons after the breakup of SCI. It was at Generation, as he received pitches for investment dollars, that he witnessed first-hand the poor standard of presentation skills.